Are you getting an “ORA-00911 invalid character” error when running an SQL statement? Find out what causes it and how to resolve it in this article. Identifiers may not start with any ASCII character other than letters and numbers. $#_ are also allowed after the first character. Identifiers enclosed by doublequotes may contain any character other than a doublequote. Alternative quotes (q’#…#’) cannot use spaces, tabs, or carriage returns as delimiters. For all other contexts, consult the SQL Language Reference Manual. 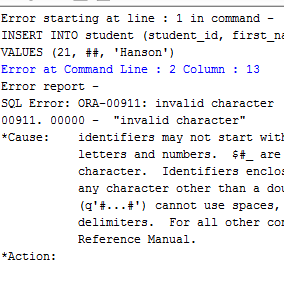 This error occurred because there was a special character in your SQL statement. It could be a special character in the WHERE clause that is not enclosed in single quotes. Oracle mentions that identifiers (such as table names) cannot start with any character other than letters or numbers. A few symbols (such as $#_) are allowed after the first character. To resolve this error, you need to remove the special character from your statement, or enclose it in single quotes. Let’s take a look at some examples of where you might get this error, and how to resolve it. Added a special character to the VALUES without enclosing it in single quotes. You can read my guide on the INSERT statement for more information. If you’re getting this error in a SELECT statement, then it’s also probably because there is a special character where there shouldn’t be. If you’re running Toad, you might be seeing some strange behaviour. If you run this command, you might be getting an ORA-00911: invalid character in Toad. But, if you look closely, there’s no special characters in the query! The error is happening because the semicolon from the commented out section is being included – even though it is commented out. To resolve the issue and make your query run, remove the commented out section. Now the query should run successfully. So, that’s how you resolve the “ORA-00911: invalid character” error in Oracle.